The Libra and Gemini love compatibility will be based on intelligent interests and mental sharpness. Gemini tends to have two different natures. They are talkative and smart and will always be able to entertain their partner. They adore the beauty of an idea. They will love Libra’s balance. Libra zodiac will adore art and beauty. These are not that different from each other. Libra and Gemini soul mates are both very mentally energetic. They will both be able to think up several different ideas when they work together. Libra will be able to give their ideas the action needed to carry them out. Gemini tends to lack this ability. They will be better at coming up with the ideas rather than figuring out how to take them in a certain direction. This will be valuable to the Libran’s mental methods. In the Libra and Gemini friendship, both will want intellectual independence. They will definitely be able to get that from each other. The planet Venus rules over Libra. The planet Mercury rules over Gemini. Venus is concerned with love. Mercury is concerned with communication. They will work well together. They will combine their forces of love and communication. The Libra person values balance with their partner almost above anything else. They do not enjoy arguing at all. Gemini will not be able to get into a debate too often. Both Libra and Gemini are Air signs. Libra is very energetic. Gemini will adore this about Libra. They will have no issue keeping up with them when they enthusiastically start a new project, have a new idea, or start a new endeavor. They both have a varied range of interests. Because of this, they will have more than enough to have challenging discussions. Libra is a Cardinal sign. They will like having a controlling position in the relationship. Gemini is a Mutable sign. They will be the one to most often come up with date night ideas. The twins are flexible and more than happy to follow the Libra’s suggestions. However, they will be happiest if it will be okay for them to change their mind at the last minute. Those with a Libra birthday will easily start things, but tends to have issues finishing them. Gemini is so flexible that they will not mind changing plans on a whim if their partner is bored and wants to move on to something new. The best thing about Libra and Gemini compatibility in a romantic relationship is that they work so well together as an intelligent team. They can show each other new and varied outlooks on life. They will be able to introduce each other to new areas of interest. Libra and Gemini in love will easily be able to open up new worlds to each other. 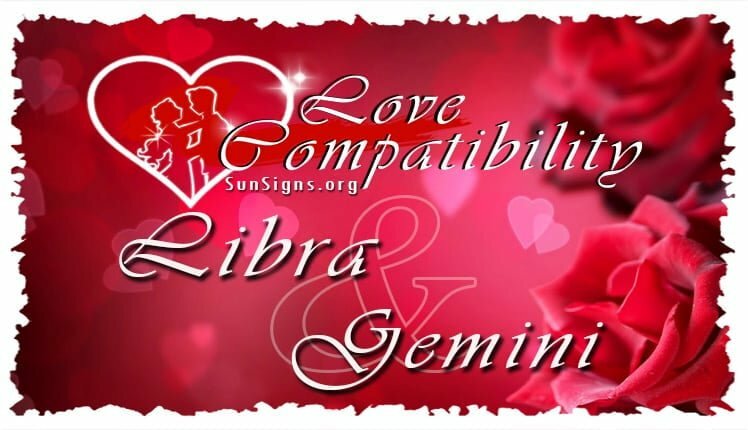 The Libra dating Gemini will have a whirlwind relationship. Their relationship is original, stimulating, zingy, and rapid moving, and always evolving. The good thing is this is exactly how Libra and Gemini star signs both like it. These signs are known for having a long lasting relationship. Their attraction will be extremely easy to see, even on the surface level. Libra man or Libra woman is the idealist of the zodiac. They will always be longing for a better reality and will be communicating that. Gemini is the expert communicator of the zodiac. They are always more than willing to discuss, negotiate and chat. They have a relationship where the idealist can discuss things as much as they want and the communicator will be more than willing to hear what they have to say. This is a very good thing for Libra and Gemini marriage. It proves they can be very good friends. This will give them a solid foundation to build a romantic relationship on. Libra and Gemini zodiac are both social signs. Their relationship will be marked by a lot of mutual friendships and a very busy social calendar. They will be seen as clever, bright, energetic, and engaging company by others. The Libra Gemini compatibility will have a feeling of mutual encouragement and balance. They will have an easy and natural star sign compatibility with each other. This will be expressed with their dealings outside of their relationship. Libra and Gemini lovers will have a relationship that is creative and adaptable and very conducive to coming up with new ideas. When Libra and Gemini are in bed, words and actions both are very important. They will enjoy giving each other romantic love letters and surprising each other with flowers and other kinds of gifts. Because of this, they will find it easy to keep the magic in their relationship alive. Their relationship will not become dull or routine quickly. Libra and Gemini will have a solid sexual relationship. Libra might want a little more of an emotional connection from Gemini. This alludes to one of the potential issues that Libra Gemini compatibility might have in their relationship. Of all the zodiac signs, Libra will long for a long lasting relationship. Gemini is not readily willing to devote to a relationship. Both Libra and Gemini partners can be flirtatious. However, Gemini being flirty can easily hurt the Libran’s feelings. Libra might think that the twin is likely to wander romantically. Gemini will have to prove that they can trust them if they want to have a successful relationship. Libra and Gemini relationships could have another major issue. Their relationship will typically be smooth, adaptable, and cheerful. However, when trouble sets in, the success of the Libra Gemini love compatibility will depend on how they handle it. Almost every relationship will go through tough spots and this one is no exception. However, both Libra and Gemini in love might be more likely to push any issues out of the way rather than dealing with them in a straightforward way. When they do talk their issues over, they will do so in an intelligent and rational way. However, they will not bring emotions into it. Libra and Gemini breakup can be avoided and this could both benefit from both of them taking the time to get in touch with their more emotional sides. The person of the scales sign adores keeping the peace in the Libra Gemini love compatibility. However they can easily get upset when there is any unhappiness in the relationship. Because of this, their relationship will not have many arguments. Gemini adores a good argument. Because of this, they would rather have a debate than a true argument. This will help keep the balance and peace in the relationship. Gemini will find this compromise worth it to be compatible with Libra. They will have no issue making this compromise. Libra will be able to recognize that independence is important to the twin over time. They will find a way to let lively Gemini have more freedom with their flirtatious ways. There is not much that can hold back the air and air zodiac compatibility. Libra and Gemini lovers are impulsive, fun, and have a varied range of interests. They will have compatibility that most others would be very jealous of. They will both need to be able to recognize their emotions and use them to make decisions. They will need to be able to make the necessary compromises. They should both remember that they should not hide their emotions. They will have the kind of connection that proves Libra and Gemini can have a successful relationship together.